Got it. Search works, lol. Last edited by big chris; 01-26-2015 at 12:16 PM. Conversion numbers I've got are way off expected to be in line with AE "weights". The calculated and theoretical values on the current Petit RC Yokomo chart are wrong. Lee Martin running his YZ-2 at Worksop for the first time, up against Neil Cragg on Sunday 25th Jan.
Last edited by neallewis; 01-26-2015 at 04:19 PM. Thanks for your work on this kind of stuff Arn0. Is the big bore spring chart measured or calculated or both? There is two columns: one for the calculated/theoretical values and one for the measured values. As done in the past, feel free to drop me the right values. I have the feeling the whole table is wrong per the comments I can get. Amain guys, whats the ETA for parts? I've only really looked at the Yokomo springs (as you know) and AE. It's good to have such a reference, as nothing else exists, but the more I look into it the more I see spring sets as not directly comparable or swappable between brands or sets. It's a difficult task for sure, and I know you've spent a lot of time on it too. Want to try the gear diff for clay any suggestions on starting weight. Well he was def. on Neil's tail. There wasn't much Gap between them. You can presume that as Lee gets more familiar with the car and setups start to be formed I can see him being much closer to Cragg. Shoot I dont think supply can keep up with demand. I have some parts on backorder as well and am in anticipation like you. I stocked up on the parts that dont break (knock on wood). 3K, built like in this video was a good starting point. Oh for sure. It's always good to watch them do battle. Lee said he hadn't run 2wd at Worksop since he ran a B4. I had a good chat to Lee and Tom about the car, and got a few setup pointers. Worksop cork surface is quite low traction, so were running shocks rear, 20g under gearbox, the under lipo weight insert, tightish ball diff and rear wishbone pin high with max toe in. I'm sure a setup sheet will be out soon. I struggled a bit with the car, certainly did a lot worse than my last meeting with the bmax2 v3, but it did improve and i managed to win my final. Main issue for me was rear traction or too much steering. Consensus after Lee, Tom and Ben Jem watched my car in final was my damping was too heavy and to run 4mm of akerman washers. I'm back at Worksop in two weeks for British Winter Open, so hopefully will see the change. 3k is good starting point on clay. Today we are proud to annouce that accomplished off-road racer Tom Cockerill of the UK will be joining the team! Working alongside Lee Martin RC in the UK, Tom will be a huge asset to the team as a top-level driver, and his vast racing and technical knowledge will help us accelerate the development of our cars. We're excited! "I've been racing about 15 years, with my major results including a UK 2wd National title, Multiple Euro and EOS A Mains, 5x Belgium GP titles and the 2wd DHI Cup. 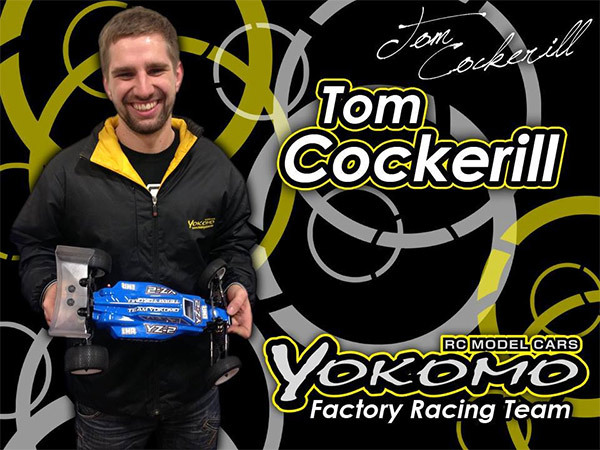 I'm really looking forward to joining the Yokomo team. The cars have been really good in testing, and I'm excited to get into the racing season with them. I'll be competing the UK National Championship, European Championships and the World Championships in Japan." Well done to Tom, I must say he was awesome at Worksop on Sunday with Lee Martin's spare 4wd, beating Lee himself. All times are GMT -7. It is currently 06:12 AM.